The Materials Center is a dynamic location for children and adults, full of things to touch and look at, that offer a multitude of opportunities for creative thinking and dialogue about saving, repurposing and finding beauty and new possibilities in everyday items. Schedule a field trip for your class to The Materials Center! Schedule a field trip for your class to The Materials Center! creative and playful experiences with the materials! The Materials Center is open for field trips on Monday mornings from 9:30am to 12:00pm. Field trips must be scheduled in advance. Please fill out the Request Form and we will respond with available dates. We welcome children ages 3+! Due to space limitations, we can only accommodate one class per day. Pay-as-you-wish, and our suggested Trip Fee is $50.00 per class. 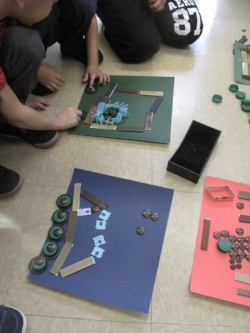 There is no cost for the materials that children select and bring back to the classroom. Teachers and parent chaperones can shop for materials too! Materials cost $1.00/pound. BYOB! Bring Your Own Bag for the materials that students take back to school.